If you just want to grab a nice jacket, though, keep reading. Most links will bring you to a relevant eBay search. 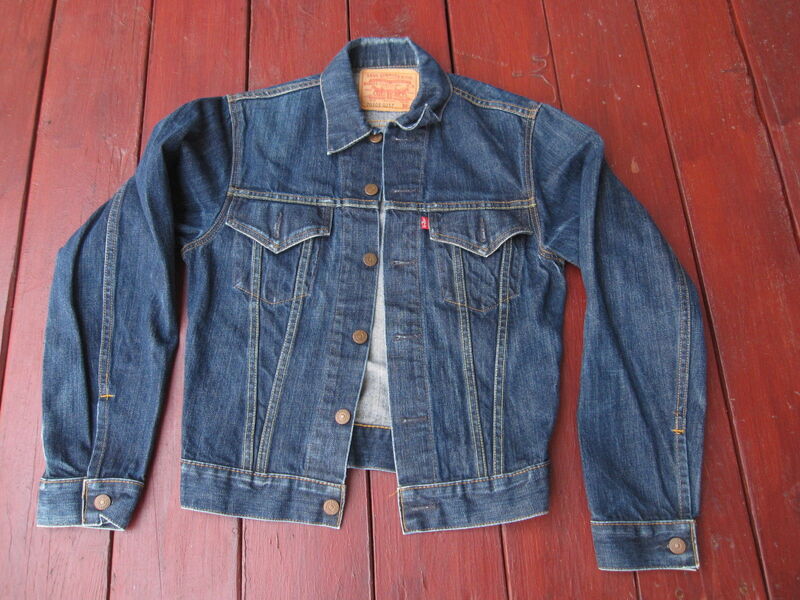 LEVI’S TRUCKER JACKET: The term “Trucker Jacket” wasn’t created by Levi’s, but by vintage enthusiasts in the 1980s. Searching this term returns a broad range of jackets, including some newer versions. For me, this is the go-to starter term to which to add modifiers. LEVI’s TYPE III: The Type III was Levi’s original term for the jacket we know today. It features the chest pockets with angled flaps and tapered cut. Original Type IIIs lack hand pockets and fit a bit shorter than contemporary versions. Up until the late 1970s, these also featured the Big E red tab. 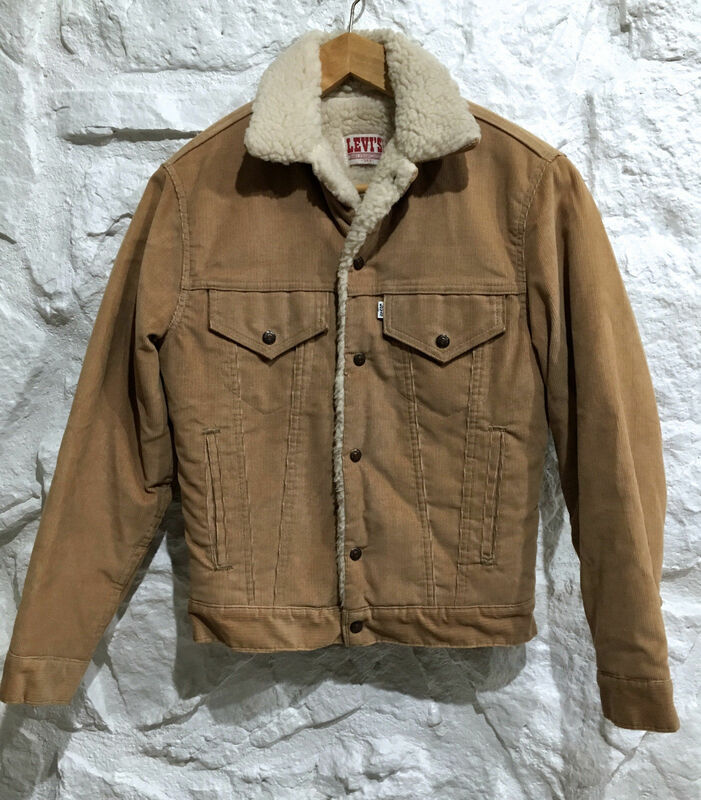 Searching “Levi’s Type III” will turn up a few more true vintage versions than searching “Levi’s Trucker Jacket.” Personally, I couldn’t live without hand pockets. But if you like the look and are patient, vintage Type IIIs can be had for less than $50. The Type III followed the Type II and the Type I. I’m going to ignore these earlier versions for now as finding a true vintage piece will run you a few hundred dollars, but Heddel’s has a good rundown of the distinction. LEVI’S DENIM JACKET: This returns a wider range of jackets, but with some digging you can uncover an underpriced trucker jacket. 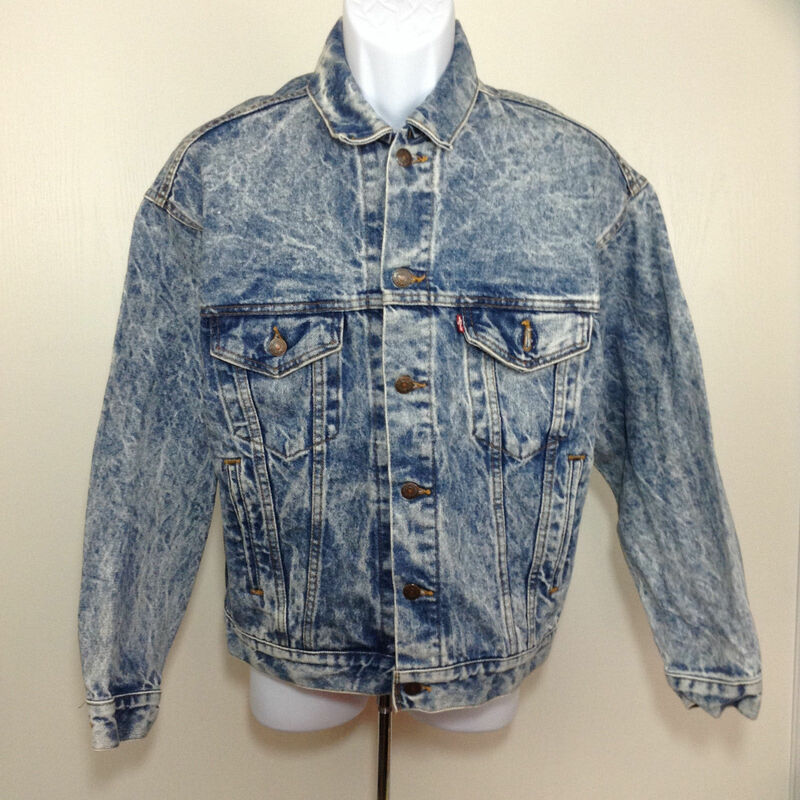 Using the term “denim jacket” in place of “trucker” suggests the seller isn’t very invested in or interested in vintage menswear. LEVI’S 70505, 70506, 70507, 70508: These are the model numbers of the trucker jacket as we know it. They generally follow small changes to the jacket over time. So, a 70505 jacket will be older than a 70507. I admit to having limited knowledge on the true distinctions between the models. Among these, I recommend the 70506. I own and wear one myself, and am very happy with it. It features numeric sizing to ensure a proper fit, slim sleeves, and all contemporary features, such hand and interior pockets. It’s my personal favorite of the bunch. In my experience, the 70508 is often oversized and generally does not match generic expectations of proper fit in 2018. Note the absence of hand pockets on this 70505. The tab features a small e. Image via eBay. 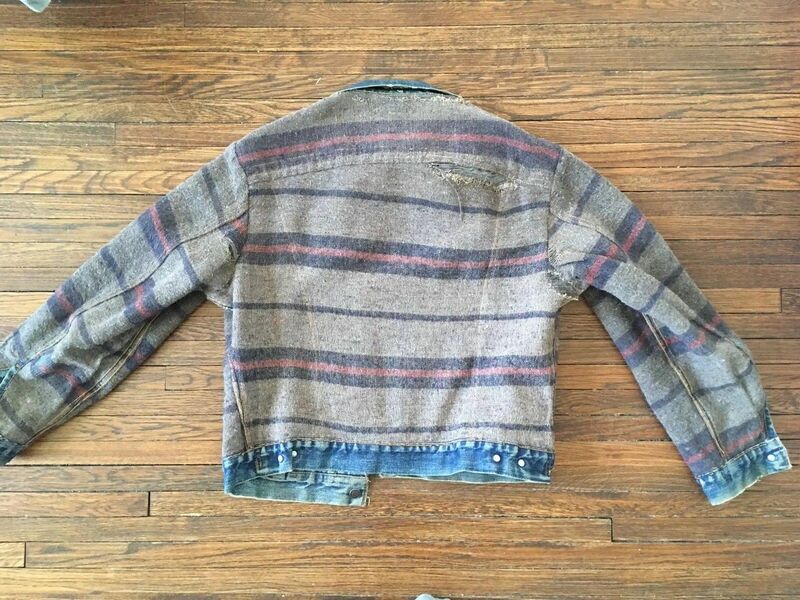 A Levi’s blanket lined trucker jacket turned inside out. Via eBay. This Levi’s Acid Wash truck shows the slouchy shoulder of the 90s. Note the wide variation in color throughout. Image via eBay. The sherpa lining on a corduroy extends onto the collar. Image via eBay. ACID WASH: Searching for Acid Wash Truckers returns jackets with—hey!—an acid wash. an acid wash created marbled coloring and contrast throughout the fabric. It’s a unique look. BLANKET LINED: A blanket lining is a striped wool fabric throughout the body of the jacket. Blanket lined jackets tend to be older, and the lining is susceptible to damage. But they’re indeed warm without the bulk of sherpa lining. [COLOR]: Levi’s trucker jackets can be found in a variety of colors. White and black are the most popular non-blue varieties, but purple, red, orange, and green exist. CORDUROY: After denim, corduroy is the most popular Levi’s Trucker fabric. They often feature the sherpa lining, but can be had without. FLANNEL LINED: Flannel lined Levi’s jackets feature a red and black check cotton lining. The lining is a little lighter than the blanket lining, but still offers a layer of warmth. ORANGE TAB: Levi’s Orange Tab truckers are more likely to be made of polyester blends and feature unusual cuts. When buying on eBay, I prefer to focus on red tab jackets, which are a bit more predictable. SHERPA LINED: Sherpa is the term for a fuzzy polyester pile lining. Unlike blanket for flannel linings, sherpa often extends over the collar and can be popped up to keep your neck warm. This is what a size 38 Levi’s Trucker 70506 looks like on a 5’8″ 155lb 31 year old man. Note that it goes to the natural waist and fits slim. Sizing up would have made it too wide in the shoulders. The sizing on Levi’s jackets has changed a bit over time. Here are some basic considerations. NUMERIC: Jackets with a numeric size tend to have a slim, tapered fit to them. In my experience, it’s best to buy your true size or size up. My size 38 70506 measures 19 inches across the chest. Levi’s 70505 and 70506 jackets will feature numeric sizing. ALPHA: Here’s where some care is need. Different versions of the trucker have different cuts, though it’s tough to identify from label alone. In my experience, 70507 jackets feature alpha sizing and a standard cut. I wear a small in these jackets. The 70508 jackets I have handled also have alpha sizing, but are oversized and feature wide arms and a slouchy shoulder. When possible, buy alpha sized jackets based on provided measurements, not sizing. SHOULDERS: This is the most important variable in Levi’s jackets. In the above picture, note that it fits a bit slim but that any larger would be a bit too wide in the shoulders. I’m okay with the look as is, though I could stand to do some push-ups. You should be able to find a Levi’s trucker jacket for under $50. It may take some patience, but there are plenty out there. I got mine, the one pictured above, for $35 plus shipping. If you’re looking for a true vintage Type III with a Big E, you may have to pay closer to $100. This is a pretty straightforward purchase. If you have never purchased vintage clothing on eBay before, buying a Levi’s trucker is good first buy. Keep an eye out for holes, tears, and missing hardware. The biggest risk, in my opinion, is with sizing. Double check measurements, especially on the shoulders. In the process of writing this, I arrived at the following theory of buying a used Levi’s trucker on eBay: Enter only the following into the search bar: “Levi’s 70506.” That phrase will return a jacket that is made in the USA, features a range of sizes, fits slim and in line with 2018 standards, offers a sturdy, indigo-dyed denim, and has the all-important hand and internal pockets. Here at Comma, Vintage, we offer a quarterly vintage clothing subscription box. Occasionally, we ship vintage Levi’s denim jackets. If you’re interested in getting other kinds of vintage clothing curated to fit your style and body, please check us out. Subscribe to Comma, Vintage today. I have a Levi women’s jacket #702400018 Any information on that would be appreciated. Tag says San Francisco. I can’t fine anything or that style.